*1. This is the day that gladdened them, the Prophets, Kings, and Priests, for in it were their words fulfilled, and thus were the whole of them indeed performed! *2. For the Virgin this day brought forth Immanuel in Bethlehem. The voice that of old Isaiah spoke, today became reality. *3. He was born there who in writing should tell the Gentiles’ number! The Psalm that David once sang, by its fulfillment came today! *4. The word that Micah once spoke, today was come indeed to pass! For there came from Ephratha a Shepherd, and His staff swayed over souls. *5. Lo! From Jacob shone the Star, and from Israel rose the Head. The prophecy that Balaam spoke had its interpreting today! *6. Down also came the hidden Light, and from the Body rose His beauty! The light that spoke in Zacharias, today shined in Bethlehem! *7. 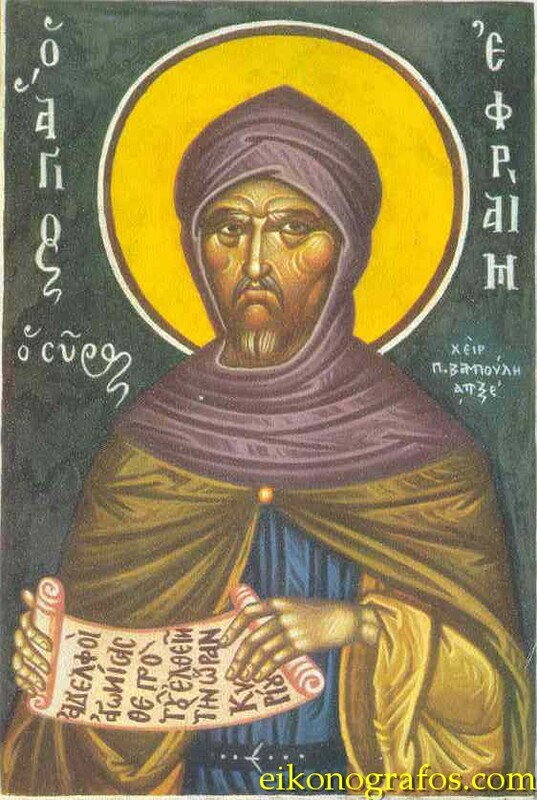 Risen is the Light of the Kingdom, in Ephratha the city of the King. The blessing wherewith Jacob blessed, to its fulfillment came today! *8. That tree likewise, the tree of life, brings hope to mortal men! Solomon’s hidden proverb had today its explanation! *9. Today was born the Child, and His name was called Wonder! For a wonder it is that God as a Babe should show Himself. *10. By the word did the Spirit foreshow Him in parable, because His generation was without marriage. The type that the Holy Spirit figured today its meaning was explained. *11. He came up as a root before Him, as a root of parched ground. Aught that covertly was said, openly today was done! *12. The King that in Judah was hidden, Tamar stole Him from his thigh. Today arose His conquering beauty, which in hidden estate she loved. *13. Ruth at Boaz’ side lay down, because the Medicine of Life hidden in him she perceived. Today was fulfilled her vow, since from her seed arose the Quickener of all. *14. Travail Adam on the woman brought, that from him had come forth. She today her travail ransomed, who to her a Saviour bare! *15. To Eve our mother a man gave birth, who himself had, had no birth. How much more should Eve’s daughter be believed to have borne a Child without a man! *16. The virgin earth, she bare that Adam that was head over the earth! The Virgin bore today the Adam that was Head over the Heavens. *17. The staff of Aaron, it budded, and the dry wood yielded fruit! Its mystery is cleared up today, for the virgin womb a Child hath borne! *18. Shamed is that people which holds the prophets as true; for unless our Saviour has come, their words have been falsified! *19. Blessed be the True One Who came from the Father of the Truth and fulfilled the true seers’ words, which were accomplished in their truth. *20. From thy treasure-house put forth, Lord, from the coffers of Thy Scriptures, names of righteous men of old, who looked to see Thy coming! *21. Seth who was in Abel’s stead shadowed out the Son as slain, by Whose death was dulled the envy Cain had brought into the world! *22. Noah saw the sons of God, saints that sudden waxed wanton, and the Holy Son he looked for, by whom lewd men were turned to holiness. *23. The brothers twain, that covered Noah, saw the only Son of God who should come to hide the nakedness of Adam, who was drunk with pride. *24. Shem and Japhet, being gracious, looked for the gracious Son, Who should come and set free Canaan from the servitude of sin. *25. Melchizedek expected Him; as His vicegerent, looked that he might see the Priesthood’s Lord whose hyssop purifies the world. *26. Lot beheld the Sodomites how they perverted nature: for nature’s Lord he looked who gave a holiness not natural. *27. Him Aaron looked for, for he saw that if his rod ate serpents up, His cross would eat the Serpent up that had eaten Adam and Eve. *28. Moses saw the uplifted serpent that had cured the bites of asps, and he looked to see Him who would heal the ancient Serpent’s wound. *29. Moses saw that he himself alone retained the brightness from God, and he looked for Him who came and multiplied gods by His teaching. *30. Caleb the spy bore the cluster on the staff, and came and longed to see the Cluster, Whose wine should comfort the world. *31. Him did Jesus (Joshua) son of Nun long for, that he might conceive the force of his own surname: for if by His name he waxed so mighty, how much more would He by His Birth? *32. This Jesus that gathered and carried, and brought with him of the fruit, was longing for the Tree of Life to taste the Fruit that quickens all. *33. For Him Rahab too was looking; for when the scarlet thread in type redeemed her from wrath, in type she tasted of the Truth. *34. For Him Elijah longed, and when Him on earth he saw not, he, through faith most thoroughly cleansed, mounted up in heaven to see Him. *35. Moses saw Him and Elijah; the meek man from the depth ascended, the zealous from on high descended, and in the midst beheld the Son. *36. They figured the mystery of His Advent: Moses was a type of the dead, and Elijah a type of the living, that fly to meet Him at His coming. *37. For the dead that have tasted death, them He makes to be first: and the rest that are not buried, are last caught up to meet Him. *38. Who is there that can count me up the just that looked for the Son, whose number cannot be determined by the mouth of us weak creatures? *39. Pray ye for me, O beloved, that another time with strength endued, I in another legend may so set forth their foretaste, as I am able. *40. Who is adequate to the praising of the Son of the Truth that has risen to us? For it was for Him the righteous longed, that in their generation they might see Him. *41. Adam looked for Him, for He is the Cherub’s Lord, and could minister an entrance and a residence hard by the branches of the Tree of life. *42. Abel longed after Him, that in his days He might come; that instead of that lamb that he offered, the Lamb of God he might behold. *43. For Him Eve also looked; for woman’s nakedness was sore, and He capable to clothe them; not with leaves, but with that same glory that they had exchanged away. *44. The tower that the many builded, in mystery looked for One, who coming down would build on earth a tower that lifts up to Heaven. *45. Yea the ark of living creatures looked in a type for our Lord; for He should build the Holy Church, wherein souls find a refuge. *46. In Peleg’s days earth was divided into tongues, threescore and ten. For Him Who by the tongues, to His Apostles divided earth. *47. Earth which the flood had swallowed up, in silence cried to her Lord. He came down and opened Baptism, and men were drawn by it to Heaven. *48. Seth and Enos, Cainan too, were surnamed sons of God; for the Son of God they looked, that they by grace might be His brethren. *49. But little short of a thousand years did Methuselah live: He looked for the Son Who makes heirs of life that never ends! *50. Grace itself in hidden mystery was beseeching on their behalf that their Lord might come in their age and fill up their shortcomings. *51. For the Holy Spirit in them, in their stead, besought with meditation: He stirred them up, and in Him did they look on that Redeemer, after whom they longed. *52. The soul of just men perceive in the Son a Medicine of life; and so it felt desires that He might come in its own days, and then would it taste His sweetness. *53. Enoch was longing for Him, and since on earth the Son he saw not, he was justified by great faith, and mounted up in Heaven to see Him. *54. Who is there that will spurn at grace, when the Gift that they of old gained not by much labour, freely comes to men now? *55. For Him Lamech also looked who might come and lovingly give Him quiet from his labour and the toiling of his hands, and from the earth the Just One had cursed. *56. Lamech then beheld his son, Noah, him, in whom were figured types relating to the Son. In the stead of the Lord afar off, the type at hand afforded quiet. *57. Yea Noah also longed to see Him, the taste of whose assisting graces he had tasted. For if the type of Him preserved living things, Himself how sure to bestow life upon souls! *58. Noah longed for Him, by trial knowing Him, for through Him had the ark been established. For if the type of Him thus saved life, assuredly much more would He in person. *59. Abraham perceived in Spirit that the Son’s Birth was far off; instead of Him in person he rejoiced to see even His day. *60. To see Him Isaac longed, as having tasted the taste of His redemption; for if the sign of Him so gave life, much more would He by the reality. *61. Joyous were today the Watchers, that the Wakeful came to wake us! Who would pass this night in slumber, in which all the world was watching? *62. Since Adam brought into the world the sleep of death by sins, the Wakeful came down that He might awake us from the deep sleep of sin. *63. Watch not we as usurers, who thinking on money put to interest, watch at night so oft, to reckon up their capital, and interest. *64. Wakeful and cautious is the thief, who in the earth hath buried and concealed his sleep. His wakefulness all comes to this, that he may cause much wakefulness to them that be asleep. *65. Wakeful likewise is the glutton, who hath eaten much and is restless; his watching is to him his torment, because he was impatient of stint. *66. Wakeful likewise is the merchant; of a night he works his fingers telling over what pounds are coming, and if his wealth doubles or trebles. *67. Wakeful likewise is the rich man, whose sleep his riches chase away: his dogs sleep; he guards his treasures from the thieves. *68. Wakeful also is the careful, by his care his sleep is swallowed: though his end stands by his pillow, yet he wakes with cares for years to come. *69. Satan teaches, O my brethren, one watching instead of another; to good deeds to be sleepy, and to ill awake and watchful. *70. Even Judas Iscariot, for the whole night through was wakeful; and he sold the righteous Blood, that purchased the whole world. *71. The son of the dark one put on darkness, having stripped the Light from off him: and Him who created silver, for silver the thief sold. *72. Yea, Pharisees, the dark one’s sons, all the night through kept awake: the dark ones watched that they might veil the Light which is unlimited. *73. Ye then watch as heaven’s lights in this night of starry light. For though so dark be its colour yet in virtue it is clear. *74. For whoever is like this clear One, wakeful and prayerful in darkness, him in this darkness visible a light unseen surrounds! *75. The bad man that in daylight stands, yet as a son of darkness deals; though with light clad outwardly, inly is with darkness girt. *76. Be we not deceived, beloved, by the fact that we are watching! For whoso does not rightly watch, his watch is an unrighteous watch. *77. Whoso watches not cheerfully, his watching is but a sleeping: whoso also watches not innocently, even his waking is his foe. *78. This is the waking of the envious one! a solid mass, compact with harm. That watch is but a trafficking, with scorn and mockery compact. *79. The wrathful man if he wakes, fretful with wrath his wake will be, and his watching proves to him full of rage and of cursings. *80. If the babbler be waking, then his mouth becomes a passage which for sins is ready but for prayers shows hindrance. *81. The wise man, if so be he that watches, one of two things chooseth him; either takes sweet, moderate, sleep, or a holy vigil keeps. *82. That night is fair, wherein He Who is Fair rose to come and make us fair. Let not aught that may disturb it enter into our watch! *83. Fair be kept the ear’s approach, chaste the seeing of the eye! hallowed the musing of the heart! the speaking of the mouth be cleared. *84. Mary hid in us today leaven that came from Abraham. Let us then so pity beggars as did Abraham the needy. Today the rennet fell on us from the gentle David’s house. *85. Let a man show mercy to his persecutors, as did Jesse’s son to Saul. The prophets’ sweet salt is today sprinkled among the Gentiles. *86. Let us gain a new savor by that whereby the ancient people lost their savor. Let us speak the speech of wisdom; speak we not of things outside it, lest we ourselves be outside it! *87. In this night of reconcilement let no man be wroth or gloomy! in this night that stills all, none that threatens or disturbs! *88. This night belongs to the sweet One; bitter or harsh be in it none! In this night that is the meek One’s, high or haughty be in it none! *89. In this day of pardoning let us not exact trespasses! In this day of gladnesses let us not spread sadnesses! *90. In this day so sweet, let us not be harsh! In this day of peaceful rest, let us not be wrathful in it! *91. In this day when God came to sinners, let not the righteous be in his mind uplifted over sinner! *92. In this day in which there came the Lord of all unto the servants, let masters too condescend to their servants lovingly! *93. In this day in which the Rich became poor for our sakes, let the rich man make the poor man share with him at his table. *94. On this day to us came forth the Gift, although we asked it not! Let us therefore bestow alms on them that cry and beg of us. *95. This is the day that opened for us a gate on high to our prayers. Let us open also gates to supplicants that have transgressed, and of us have asked forgiveness. *96. Today the Lord of nature was against His nature changed; let it not to us be irksome to turn our evil wills. *97. Fixed in nature is the body; great or less it cannot become: but the will has such dominion, it can grow to any measure. *98. This is the day that gladdened them, the Prophets, Kings, and Priests, for in it were their words fulfilled, and thus were the whole of them indeed performed! *99. Glory to the Father and to the Son and to the Holy Spirit. Today Godhead sealed itself upon Manhood, that so with the Godhead’s stamp Manhood might be adorned. *100. Both now and ever and unto the ages of ages. Amen. The voice that of old Isaiah spake, today became reality. For the Virgin this day brought forth Immanuel in Bethlehem. 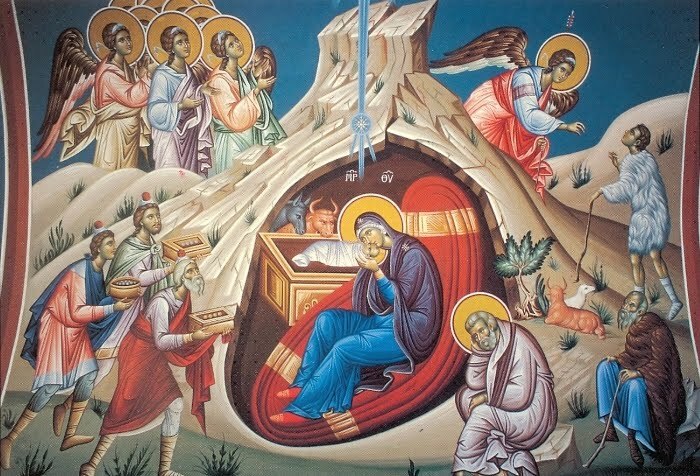 To the readers and visitors of Mode of Life, we wish to extend our heartfelt well-wishes and prayers for you all so that you may have a blessed Feast of the 12 Days of the Nativity (Dodecaimera); And may God always keep you all peace, joy, health and wisdom, and may He bestow upon you all forbearance, patience and progress in all your endeavours which are pleasing to His will. “Magnify, O my soul, her who is more honorable and more exalted in glory than the heavenly hosts. Magi and shepherds came to worship Christ, Who was born in the city of Bethlehem.